There's a force that comes from a flicker in sunlight every eleven years, which eleven years later has an effect on global mean surface temperature on Earth. Neither David nor Jo can explain what it is, how it works, how it could be detected, or why it hasn't worked yet: "if only they had a mechanism" that could explain it. "Theories" include, some simultaneously, that Force X makes the planet reflect more sunlight, Force X makes the sun supply less energy, or it could be some as yet unknown "field, flux or particles" coming off the sun that affect the climate. Jo and David know it exists because no-one has seen or heard of it. There's been no sighting or sounding. No-one has detected it (or it's supposed effect, except for David and Jo's wishful thinking). "The dog that didn’t bark" is how Jo describes it, presumably alluding to a Sherlock Holmes mystery. When the sun has had a more active eleven year cycle, this Force X suddenly appears for an instant as flickers in sunlight, and warms the planet eleven years later. When the sun has had a less active eleven year cycle (such as Solar Cycle 24), then Force X pops out again with flickers of sunlight, and eleven years later cools the planet. The force of Force X is 10 to 20 times as great as the change in solar irradiance, yet while normal changes in solar irradiance can be measured, this monstrously huge Force X can't be detected. Since the peak in solar irradiance in the mid-1950s, Force X hasn't done much of anything, despite it's wondrous force. However, with Solar Cycle 24 being even less active, Force X is bound to do something this time around. 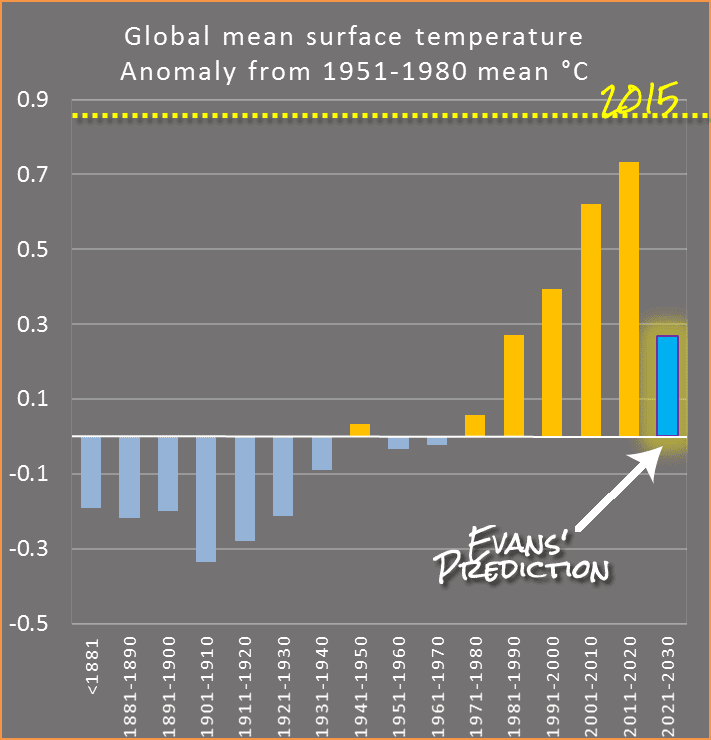 The 2020s will be colder than the 1980s, according to this "theory". 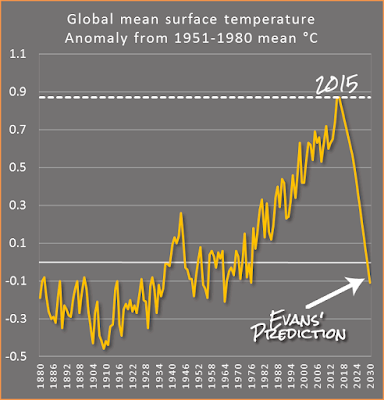 That means that by 2030, the global mean surface temperature will be back to that of 1976 (see below). Looking ahead a bit: cooler, possibly starting as early as 2017. Regardless of which of the TSI datasets or reconstructions most bandied about that you believe, there was a fall off in underlying TSI around 2004. The length of the current solar cycle is around 13 to 14 years, so sometime around 2017 (or maybe a couple of years after) this should result in global cooling. Prediction: There will be a sustained and significant fall in global temperature from about 2017 – 2022, of about 0.3 deg C. The 2020s will be cooler than the 1980s. To think that deniers complain if the global mean surface temperature observations are a teensy bit different from the model projections. 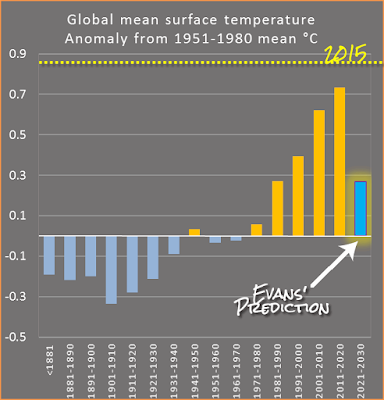 Or if an expected ENSO event doesn't happen for a year. The notch was “the dog that didn’t bark“, the big clue. Somehow at the peak of solar incoming energy, there was a sudden shift in the way Earth responds to incoming sunlight. The extra energy (which is very small but detectable with Fourier analysis) is reflected or not absorbed by the system. This is a screaming red flag that some important change is going on, through a mysterious unknown mechanism. ....At some point David realized, from the electrical analogy, that the timing was suspiciously precise. Because the delay was the length of a solar cycle, and the notches were synchronized to the Sun, the cause of the delay wasn’t on Earth — but inside the Sun. The delay was not a smeared out thing, but a literal delay — the effect due to a change in TSI only begins to act one sunspot cycle later, and quickly affects the surface temperature here on Earth. The flickering signals from total sunlight are a clue that precedes some other change in the solar dynamo. We’ll talk about the possible mechanisms in future posts, because there are a lot of fields, fluxes and particles coming off the Sun that could potentially affect our climate. it must be a "field, flux or particle coming off the sun" that affects the climate, which hasn't been detected and can't be explained. turns on the tap that controls how much energy the sun sends out and at the same time turns on the tap that controls how much incoming sunlight the Earth reflects back out, "without changing the heat of the planet". An all-powerful cosmic force, that one. As David put it: it "works by modulating the albedo of the Earth, or the amount of solar radiation reflected straight back out to space without changing the heat of the planet, by clouds and ice and so on. Force X turns the tap that controls how much sunlight pours into the Earth’s climate system. This could be through UV, magnetic field effects, solar wind, or some form of electrical field." In other words, neither rocket scientist David or Jo still has the first clue about how this non-shift in energy makes a huge difference to the energy in the Earth system. A shift so huge from an undetectable source, that the "effect on temperatures of changes in force X is 10 to 20 times as great as the immediate effect of changes in solar radiation"
David put up a chart that he said he put together from multiple sources, but it doesn't look right to me. Now I understand that there are lots of different versions of TSI floating about, but David seems to have chosen to lump them all together, and thrown in some sunspots, rather than pick one or two to show separately. Here are some more charts, which highlight the differences between what David Evans has come up with and the sources I found. First a chart with global mean surface temperature (GISTemp) and sunspots. It's animated to show what happens when you shift the sunspots forward eleven years. The delay doesn't affect the stark rise in surface temperature. Nor can David's notion explain why temperatures keep rising even when solar activity is on the decline (delayed or not). Then a chart with TSI and surface temperature, again using GISTemp, and again showing the data with and without any eleven year delay. spent more time learning the bulk of the science as it is, rather than cherry-picking bits and pieces from contrarians he fancies. came to accept that the natural world doesn't change the laws of physics on a whim. This new theory can be tested soon. It’s falsifiable — unlike the carbon religion. More on that soon too. I wonder what Jo means by the "carbon religion"? She can't be talking about the various theories underpinning climate science, because they are falsifiable. On the other hand, if Jo and David hadn't kept shifting the goal posts, their "theory" would already have been falsified. Jo's testing promise was immediately followed by another panhandling plea. Jo Nova and her partner David Evans have been drip-feeding the drips for almost two years, with precious little to show for it. That seems to be so that Jo can continue to con people into sending her money on the strength of a promise that one day they will find a way to prove that the science of the past two centuries is all wrong and there is no greenhouse effect. The chance of that happening is less than the chance of a major ice age coming inside of the next 50,000 years. Jo Nova's Solar Force be With You - if you're a wacko science denier - May 2015, with a list of solar acronyms and description of various sources of solar data. Not again. It makes me feel a little ill to read Jo Nova's blog and her smug blatant lies and misrepresentation of science. She is continually calling scientists dishonest but she is the one who is dishonestly and deliberately misrepresenting science. As an Australian, I find her a disgrace to Australia. As a Canadian, I cannot express my joy that Ted Cruz has renounced his Canadian citizenship. It's an old ploy, the con men claiming others are the con men. Codling and Evans are absolutely classic purveyors of woo of the worst sort. It says a lot about the gullibility of humans that C&E get such an easy run of it in their peddling of their snake oil. No doubt they will plan on declaring victory if a la Nina develops and the subsequent cooling sets in, thinking it's their magical force. Quite. This is my first sighting of "No warming since 2016". That was my impression too. Other that yet more implausible claims about expertise that are clearly designed to appeal to her audience. However, I doubt anyone on her side noticed. I am sure we will soon be hearing that Force X is actually gravity waves from pulsars. I am currently preparing a paper to show that gravity waves cause El Niño and autism. Clearly the gravity waves affect the Sun because it is a lot bigger than the Earth and catches more of them. I only mention this here to establish priority. I am hoping to beat David Evan and Deepak Chopra into print. I believe Jo Nova's mention of the “carbon religion” refers to the stout defence of coal-burning electrical generating plants by the Australian and the US supreme court but I may be mistaken. One of the magical qualities of Farce X is the way its parameters can be changed so effortlessly every time its 'predictions' fail. 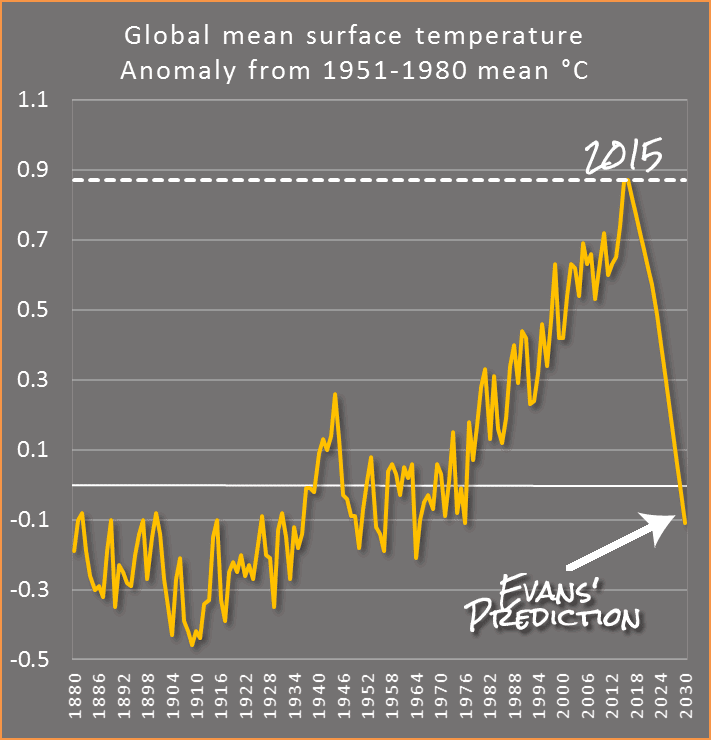 And, with every parameter change, a fossil fuel industry acceptable forecast is still obtained. Hey, we're not changing parameters!! We're adjusting theory to fit the data. And we're gonna keep doing that until it fits. Ignoring the fact that the hypothesis is nonsense, the other thing wrong with it is it too complicated. The principle of Occam's Razor is you go with the simplest explanation that fits the facts. I assume the reason these alternate theories are presented is to help deniers along with their confirmation bias? It seems it does not matter if the alternate theories are plainly wrong, the important thing is they just exist. Deniers do not understand how the climate works, but they do understand that they do have to be able to point to an alternate 'theory of climate' in order to dismiss what they do not understand. Hence Farce X...because a void needs a filling. Either some undetectable energetic rays with a delayed heating effect are produced by the sun, or the increase of atmospheric CO2 traps more of the infrared radiation re-emitted to space, thus trapping heat. One of those is testable. Maybe Force X is something like the french scientist Blondlot's N-rays. Someone who purposefully introduces an ~11-year smoothing into a data set ought to be shot in the head, if they also don't downsample (decimate) the resulting time series below the filter halfpoint (in this case ~11 years). It's called introducing false autocorrelation (over and above what's already there in the raw data). One should also be shot in the head if they divide time series with a TSI time series (with a known spectral peak ~11 years) and starts seeing low amplitude 'notches' at, yes, you guessed it, ~11 years. Next up for DE and JN? The daily and annual ND theories which do not take into account the Earth's orbit or rotation. BTW, the whole MFT/OFT looks suspiciously like LINEAR harmonic analysis. A 'purported' quote from DE: We know it's the Sun woot done it, because we don't see the ~! !-year TSI cycle in the various surface temperature proxies. Speaking of mendacious deniers, people might like to consider submitting a question for QandA to put to Mark Steyne on tonight's episode. Larry Marshall must be relishing the timing of Steyne's appearance - assuming that the CSIRO climatology gutting is put to him at some point in the program. Or at least ask Mark Steyn how the Michael Mann defamation suit is going. Spoiler alert: I am sure if he is asked, he will twist it into a rant about Free Speech. Mark Steyn is an enemy of free speech, not an example of it. His history of defamation is a threat to free speech, not an example of it. He is also an enemy of humanity, with his anti-climate mitigation stance. Shame on qanda for having him on the panel. Fourier Analysis of any piecewise continuous wave function that does not repeat, can only hint at any regular sinusoidal mechanisms that give rise to this more complex waveform. Unless the coefficients are fully understood and their periodicities match real physical drivers such as the Sun's eleven year cycle and the various ocean heat transfer cycles that perturb any measurable quantity. This just cannot work as none of these are regular. The inherent noise in the system is larger than any one so called Fourier coefficient. Any smoothing will inject a periodicity into what is random noise. Anyone who thinks that using circuit analysis is valid for a very large system such as Earth's Climate that is chaotic in the short to medium term is deluding themselves. To build an analogue circuit of the Earth's climate would take literally millions of components. To then postulate a mechanism that is totally unknown for a very dodgy periodicity and phase derived from a very simple model of a temperature graph is simply self delusion at best. All Fourier Coefficients have two values a magnitude and phase (angle). It seems this magical unknown farceX has a phase of eleven years. It is also quite convenient that Fourier analysis of this temperature graph will not show any linear or exponential continuous rise in the 'function' unless you assign coefficients to periodicities far longer than the curve in question. Twits who think treating the Earth Sun system as a black box and see what pops up with some rudimentary method not fit for use are wasting their time. We used three dimensional Fourier Analysis of our x-ray data to calculate the electron density of proteins with hundreds of thousands of atoms. The electron density is simply a reverse Fourier Transform of the data knowing both the magnitude and phase of every measurement. Measuring the phases is the tricky bit. By the way Cowtan is a crystallographer and he is used to dealing with tricky noisy huge data sets. Thanks for the explanation Bert. To reiterate a Fourier analysis by fools does not see the linear or exponential rise in the data they purport to analyse. They blindly predict a cooling!